Automatic Shrink Wrapping Machines|Automatic Shrink Wrapping Machines manufacturers|Automatic Shrink Wrapping Machines suppliers|exporters|in Mumbai,India. Supplier & Manufacturer of Automatic Shrink Wrapping Machines. 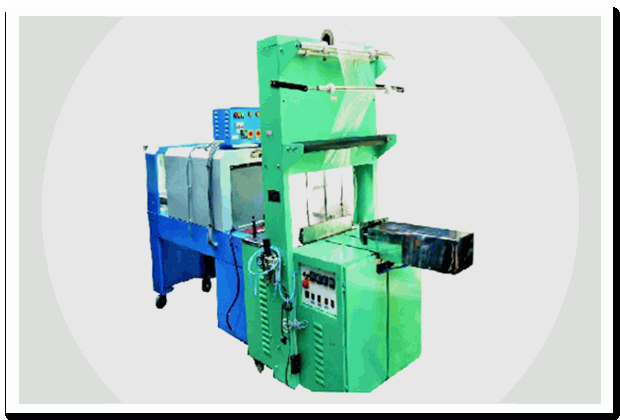 Our product range also comprises of Heat Shrink Tunnel Machine, Shrink Tunnel Machine and Shrink Tunnel Heavy Duty. Automatic Shrink Wrapping Machines Features of Automatic Shrink Wrapping Machines: Double reel Automatic Shrink wrapping system for the bundling of any kind of cylindrical, rectangular and irregular shaped products. Auto Conveyor for automatic conveying of packs can be provided on LHS -/- RHS to suit individual requirement. Product feeding manually arranged on the loading table with push button for the starting of the automatic cycle also. Space saving sleeve, pneumatic pusher for automatic intake of packs. Individual sealing bar with twin sealing elements. Endless PVC or S.S. slate chain conveyor. Specially designed S.S. tubular finned heaters for minimum power consumption and maximum heat transfer. Heavy duty turbo blower for effective and efficient hot air circulation. We are one of the major automatic shrinking machines manufacturers based at Mumbai in India. Our automatic shrinking machines enable us to package any irregular shaped product. The automatic shrinking machines is outfitted with an auto conveyor on the LHS or RHS as per the client requirement, to convey the packs automatically. Class insulation provided with glass wool and asbestos/calcium silicate sheet for machine panel and silicon tubing for conveyor rods. Over backed heat resistant power coated used. Lading and cooling zone provided as standard feature as outlet. Heavy duty A.C. motor provide with gear box and controller for heavy load conveyor. Stainless steel conveyor roller with silicone coated. Auto temperature control. Full heavy duty power coated tunnel covers and electric panel board. Pesticides Bottle, Pharmaceutical Bottle, Textile , Cosmetic Items Like Talcum Powder Bottle, Books & Stationery Like Playing Cards, Mineral water, Food Products Like pickle bottle, Soap & shampoo Bottle, Gift Items , Welding rods , etc.